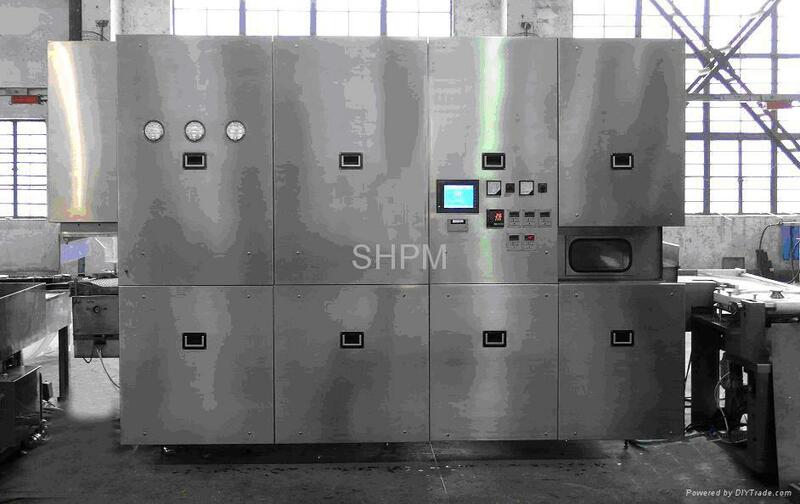 This machine consists of Model ACQ-II Ultrasonic Type Washing machine, Model GMSU-400C Tunnel Type Bacterium Killing Oven, Model AGF6-Ampoule Wire-drawing Filling and Sealing Machine, Model GG Supply Water Filtering Device and 100-stage laminar flow purifying. Putting the tray full of ampoules into the ACQ-II Ultrasonic Type Washing Machine , it will spray water automatically. When the start-up sing is displayed, press the PLC control button. The tray will be immersed into water, and the ampoules will be fed into a position between the ultrasonic transducer under the action of a tray-pushing cylinder and washed by ultrasonic ware for about 1minute (time can be adjusted). Then the trap enters a disk and turn over for 180o, and then, the ampoules leave the water with their mouths downward, then they are put into internal spraying and external drenching station under the drive of top tray cylinder, external wall of bottles are drenched and internal wall of bottles are sprayed and washed by water and gas in three times circle-washing (washing time and times be set according to actual production requirements.) 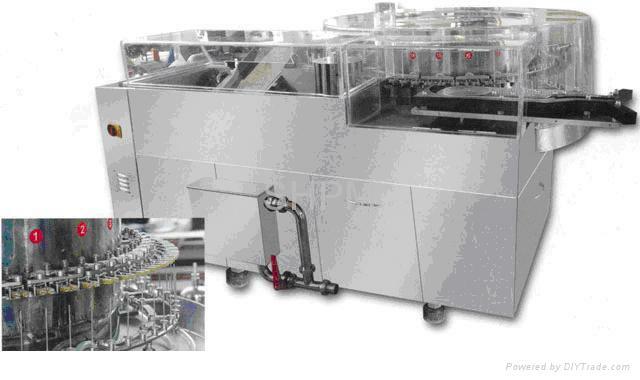 After above procedure is finished, bottles are rushed with gas to remove residual water, then with draw automatically. After that, the ampoules are conveyed into the tunnel of oven by the manual turn bottles. Under the monitoring of intelligent system of GMSU-400C Tunnel Type Bacterium Killing Oven, bottle are fed into preheating zone, high temperature killing bacterium zone (temperature is 350c); bacterium killing time is ?Y5 min) and low temperature zone of tunnel bacterium killing oven. The speed of chain is stepless adjustable. 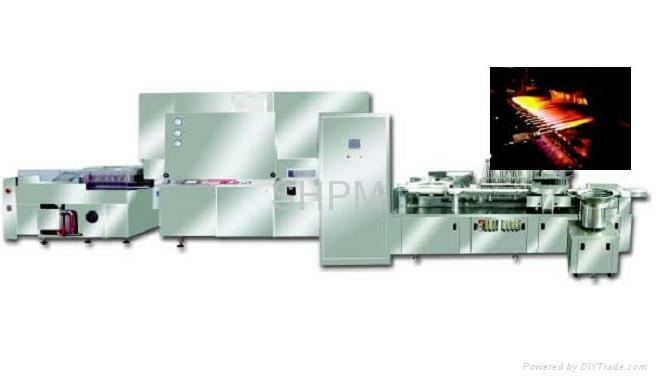 It has paper recording or non-paper recording in temperature control system. 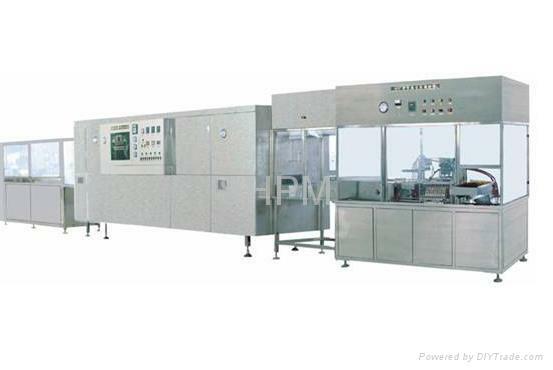 Whole operating process always under the protection of 100-stage laminar flow.It is dry and non-bacterium after cooling. The ampoules, which have been removed heat, are taken out manually, then into the Filling and Sealing machine to fill and seal. 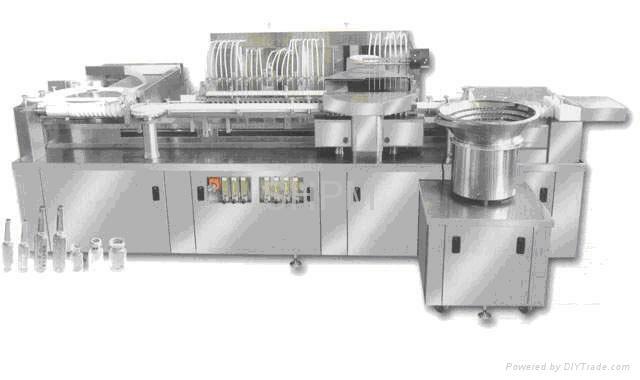 Ampoule-bottles are put into passage for bottle entrance in bulk by the transmission belt of AGF model 6-ampoule filling and sealing machine, under the control of barrier six ampoule-bottles are segregated every time, then carried to filling unit and stealing by teeth-plate in interval. The filling and stealing is under the protect of one hundred stage lamina flow. Sealed ampoule-bottle is put outside bottle-pusher. Speed control: 30 ~ 36 r/min (staples speed adjustment).